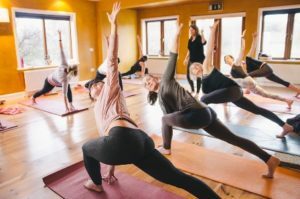 Thinking of becoming a yoga teacher? It’s worth taking time to contemplate what is involved and what you truly want before you invest a lot of time in research, travel and money. Here are some good questions to ask yourself before you take the leap. I have been asked that so many times and every time I give the same answer regardless of ability, age or any other factor. YES you are, you are perfect, whole and complete right now. You have the power to do anything you wish with your life. The question is, do you want to be a yoga teacher! An obvious one, but teacher training is a huge commitment. You’ll be practicing every day, doing homework, reading, studying philosophy and anatomy, and before you know it you are totally consumed by yoga. So, you need to be passionate about and dedicated to yoga. You have to be ready to dive in wholeheartedly and work hard. Contrary to popular belief, you don’t have to be a yoga expert before starting a teacher training. 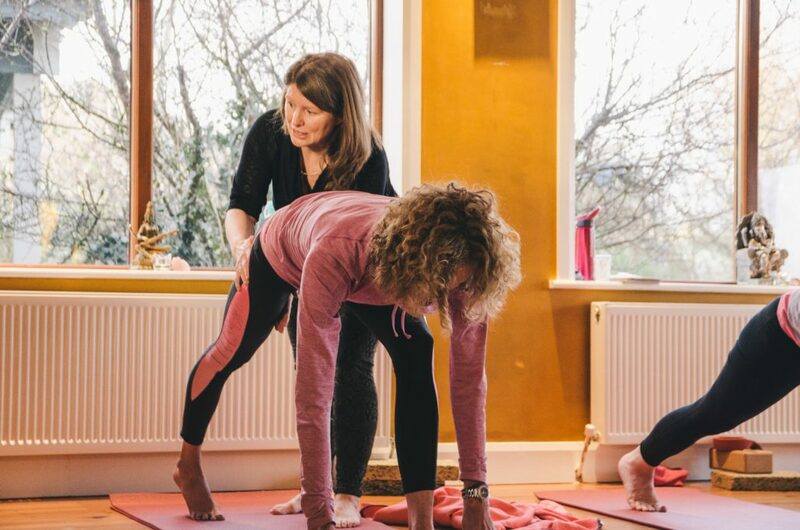 That’s what the course is for – to build your practice and understanding of all elements of yoga. But we do get enquiries from people who have never taken a class before. Think about it the same as you would if you were considering becoming a Spanish teacher – it is not possible unless you know the language. You must know the basics of moving on your mat and following instructions. Anusara Yoga 200 hour teacher training is organised so that the first 100 hours is an Anusara Immersion programme devoted to students developing their practice while introducing the fundamentals of anatomy and movement plus introducing the rich and wonderful world of yoga philosophy. Ideally, you’ll have been regularly practicing and attending classes for at least 1-2 years. Yoga teacher training is a big commitment. You’ll be practicing every day, and going to the course one weekend (3 days) a month, attending a 5 day intensive and most likely using some of your annual leave to make all the dates. In between each module there is anatomy and asana homework, study, presentations and public classes. In other words, there is a lot of work but on the positive side you will love it – it is all so life affirming and interesting. If one weekend a month isn’t ideal, you can do the training as a Residential Intensive over the course of 26 days. You will eat, sleep and dream yoga while taking yourself away from the normal ‘noise’ of everyday life. This is a great choice if you have the free time. 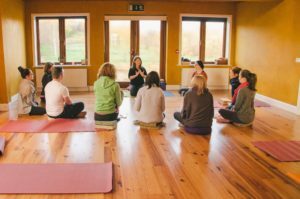 Each yoga teacher training creates a very close-knit group of people who support and help each other out. I know it is a cliché, but it is truly a journey. You don’t have to be joined at the hip with your fellow students but you are required to be fully involved in group discussions and give 100% to your process. You will make good friends and create memories that may last a lifetime. The process of teacher training is truly transformational. You may not even want to teach yoga but want to deepen your practice on a physical and spiritual level. Either way, whatever your intention, there is one thing I know for sure, yoga works. But be warned, you might find that you are happier, healthier and in a sense freer as a result of throwing yourself into the study of this ancient and sacred practice! I hope to see you on the mat someday. If you have any questions please get in touch I would be happy to chat. Better still, come and visit us on our open day on May 12th. 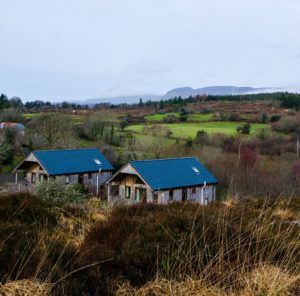 Please visit our website here, and when you come along you can get a feeling for how very special this place, Ard Nahoo is. You can practice yoga with me, meet some past pupils and then we can a cup of tea and a chat afterwards. https://www.ardnahoo.com/wp-content/uploads/2018/03/DSC_0794.jpg 1555 2348 ardnahoo-admin https://www.ardnahoo.com/wp-content/uploads/2017/09/Ard-Nahoo-logo-2.png ardnahoo-admin2018-03-20 11:11:322018-03-22 13:05:46IS YOGA TEACHING FOR YOU?